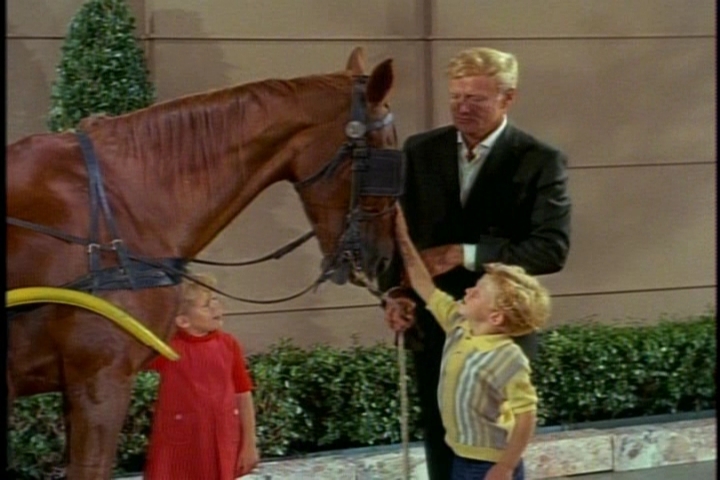 Season 1, Episode 3, A Gift Horse, 9/26/66. Written by: John McGreevey. Directed by: William D. Russell. 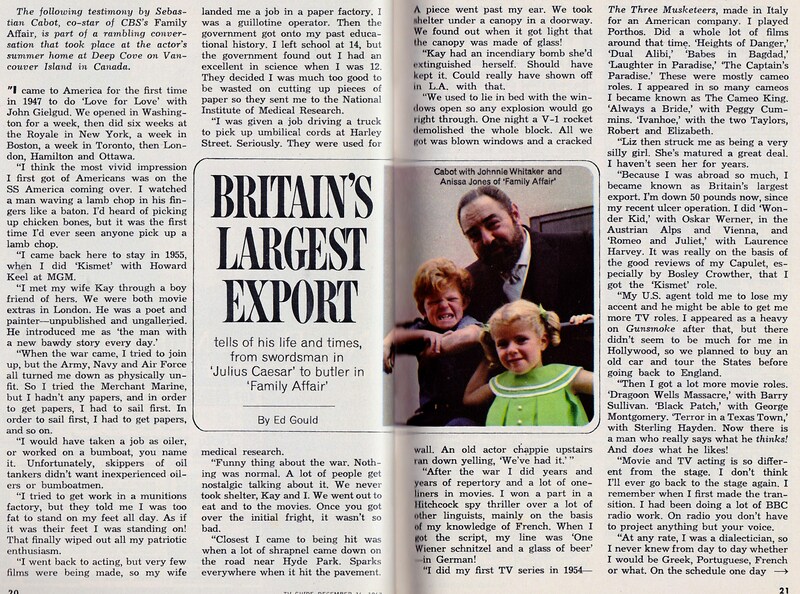 Uncle Bill returns from East Africa with gifts for the kids, and Cissy gives him a hand-knit tie. With $1.07 between them, Buffy and Jody decide to find the perfect gift for Uncle Bill. Baffled by French’s suggestion of a gift certificate, they search in vain for something Bill needs. 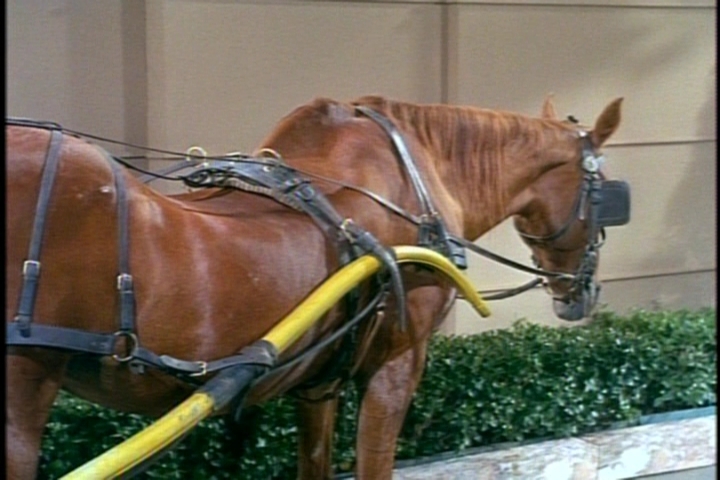 Soon they learn that their friend Mr. McGovern, who operates a hansom cab with a broken-down horse named Rosie, is giving up his cab and parting with Rosie. Of course, they decide a horse is the one thing Uncle Bill needs. Rosie. She really does look broken down. When French learns that McGovern sold the children the horse, he bawls the man out for taking advantage of children. Realizing what the gift means to the twins, however, Uncle Bill accepts it and makes arrangements to send “the Rose of Killarney” to live with friends near Danbury, Connecticut. Mr. French sees the horse. 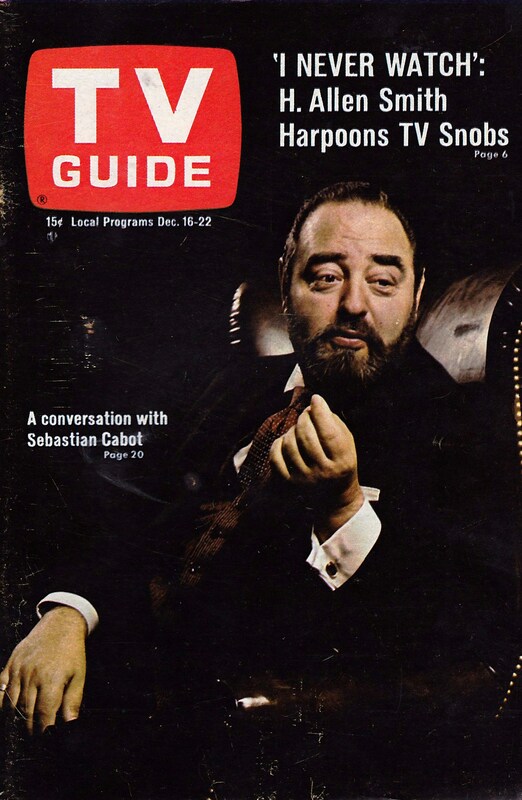 I love Sebastian Cabot’s reactions! Random Thoughts: Kids, horses–Uncle Bill’s apartment is becoming a real dumping ground. A cute episode. At first, I did think Mr. McGovern was unethical for allowing the kids to “buy” the horse, but he obviously wanted to make sure his friend had a good home. 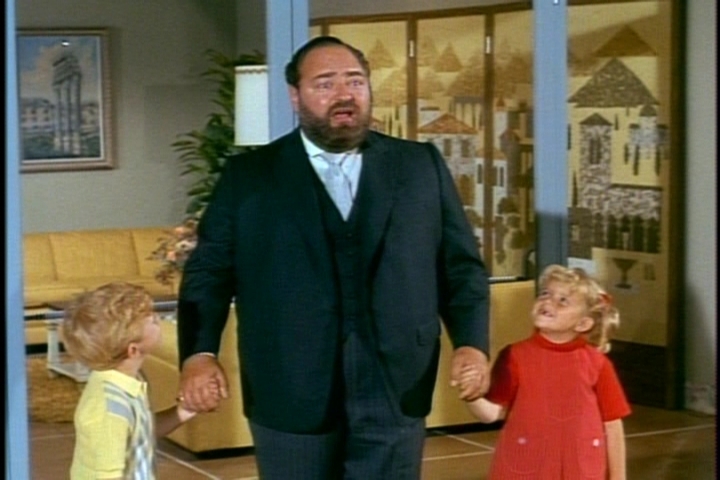 Not a “Helicopter Butler,” Apparently: When French leaves to confront Mr. McGovern about the horse, no one is at home to supervise 6-year-old Buffy and Jody. Guest Cast: Emmet Parnell McGovern: Paul Hartman. Scotty: Karl Lukas. 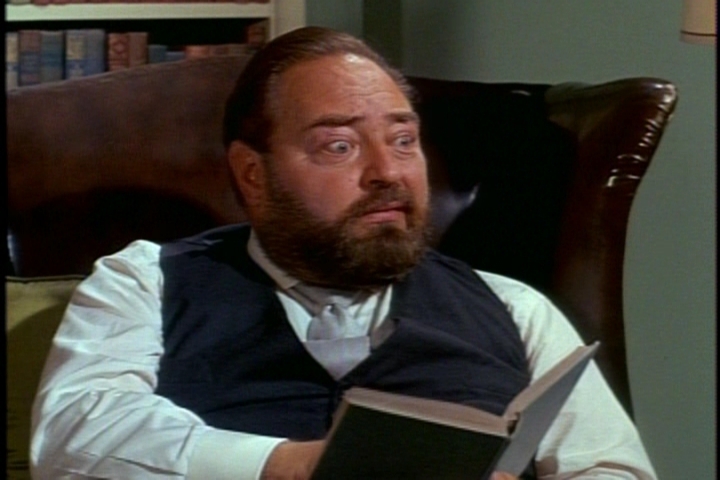 Hartman’s film career included Inherit the Wind and The Thrill of it All. He had a regular role as Bert Smedley, the barber, on Petticoat Junction, and as Emmet Clark in the 1967-68 season of The Andy Griffith Show and on its spin-off Mayberry R.F.D. 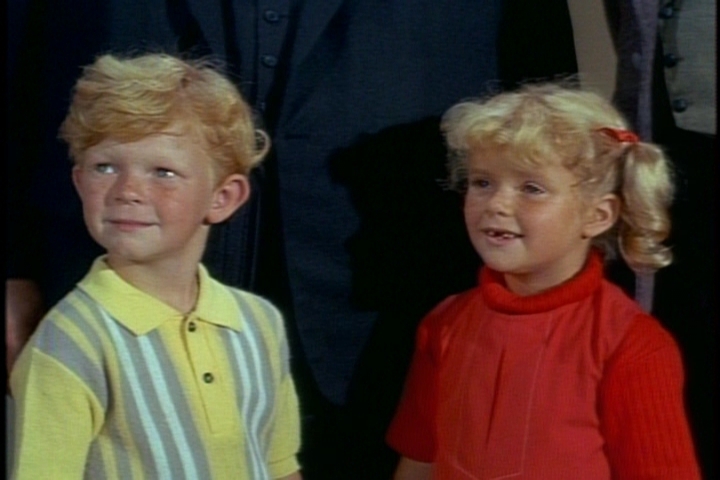 Lukas would return as Scotty in quite a few Family Affair episodes. 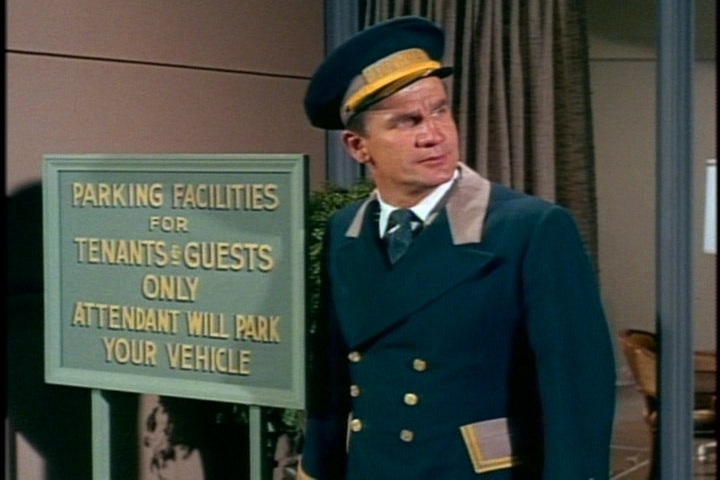 Fun Facts: Scotty, the doorman, makes his first appearance. Scotty. Gee, do you think that big sign will figure into the upcoming scene? 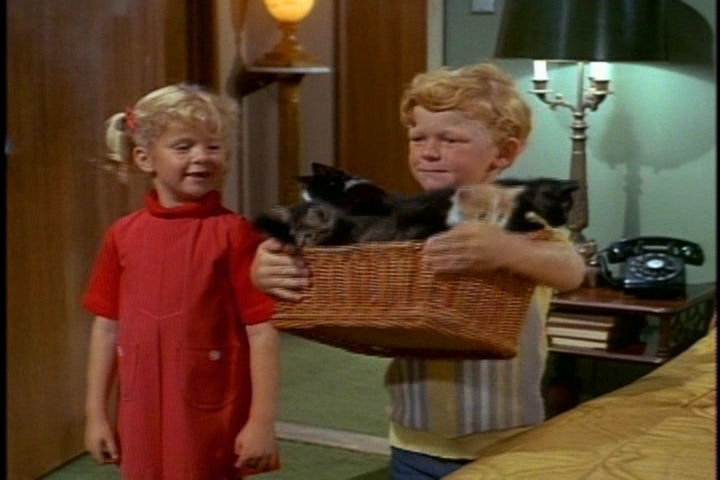 In the episode’s tag, the twins give Mr. French a gift–kittens! Of course, he takes this turn of events in stride. Another kitten shot because…well, I love kittens. And it’s my blog. * He thinks Michael Redgrave is a better actor than Laurence Olivier. * Walt Disney doesn’t pay well. 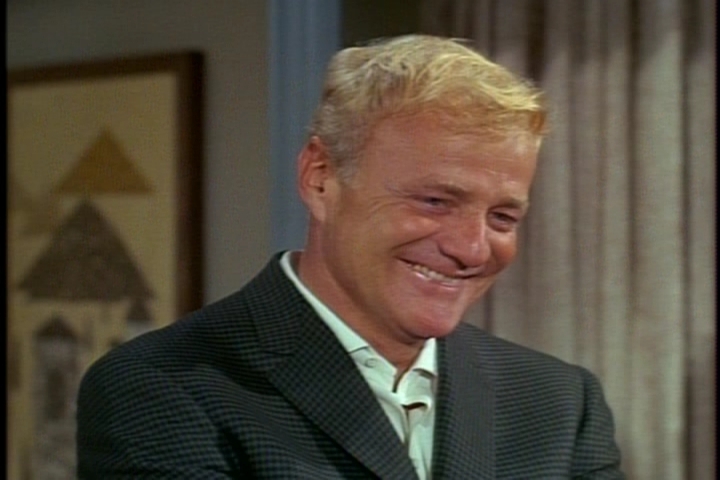 * Brian Keith loves kids but doesn’t suffer foolish reporters gladly. 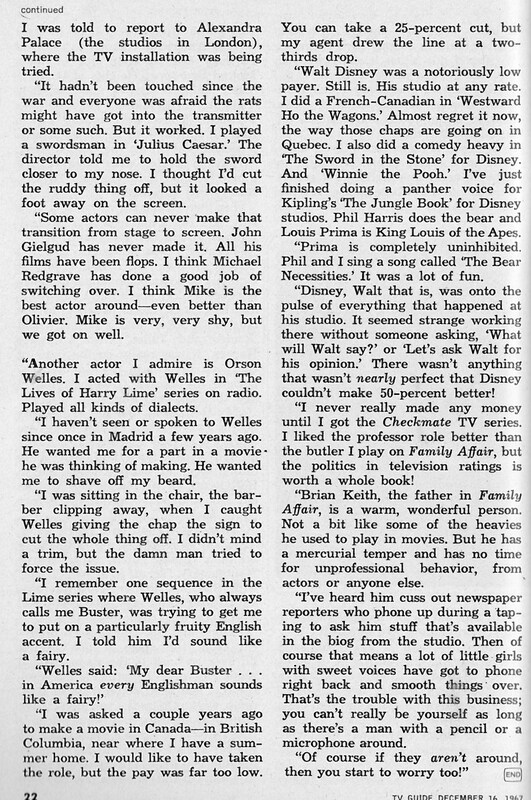 This entry was posted in Family Affair, Television and tagged 1960s, Anissa Jones, Brian Keith, Classic Television, Family Affair, Johnny Whitaker, Nostalgia, Sebastian Cabot, Television, Viewmaster. In a fit of nostalgia on a dull Sunday afternoon I set about rereading – and reenjoying – your posts. 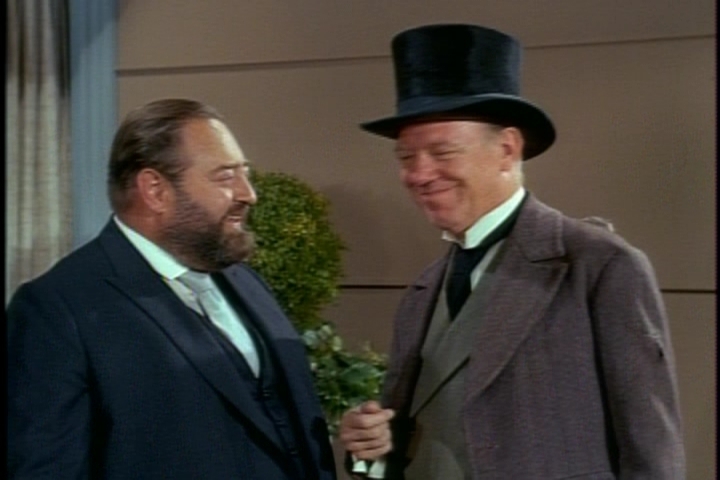 About Paul Hartman: in ‘Those Calloways’, he also played alongside Brian Keith, portraying a villager. Though not exactly an animal lover, I really like this animal-focused Disney movie for its very beautiful pictures and – of course – brilliant Brian Keith acting. A pretty young Linda Evans co-starred in ‘Those Calloways’.